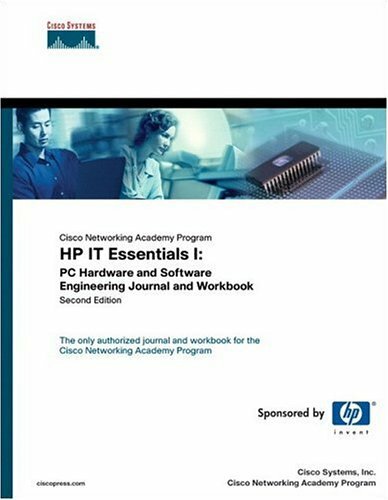 The IT Essentials I: PC Hardware and Software Engineering Journal and Workbook, Second Edition, supplements the web-based course in the Cisco Networking Academy Program. The exercises in the Engineering Journal and Workbook help you become thoroughly knowledgeable in the material in this course by including additional topical coverage and vocabulary exercises. This workbook also provides review questions to help study to pass the CompTIA A+ Certification exam. Each chapter includes concept questions and review questions that test your knowledge of the material in different ways. Concept questions range from real-life scenarios to reflective ideas where the answers are not always obvious. Review questions provide you with an opportunity to demonstrate and strengthen your understanding of the concepts to begin preparing for the CompTIA A+ Certification exam or to pursue a career in the IT industry. If you have any questions about this product by Cisco Press, contact us by completing and submitting the form below. If you are looking for a specif part number, please include it with your message.